For the first time in France, part of the exceptional collection of early drawings from the Museum Boijmans Van Beuningen in Rotterdam is exhibited in Paris, at the Fondation Custodia. From Jheronimus Bosch to Pieter Bruegel and Abraham Bloemaert, 142 of the most important drawings from the Rotterdam museum holding one of the richest collections of fifteenth- and sixteenth-century Netherlandish drawings, are unveiled to the French public. 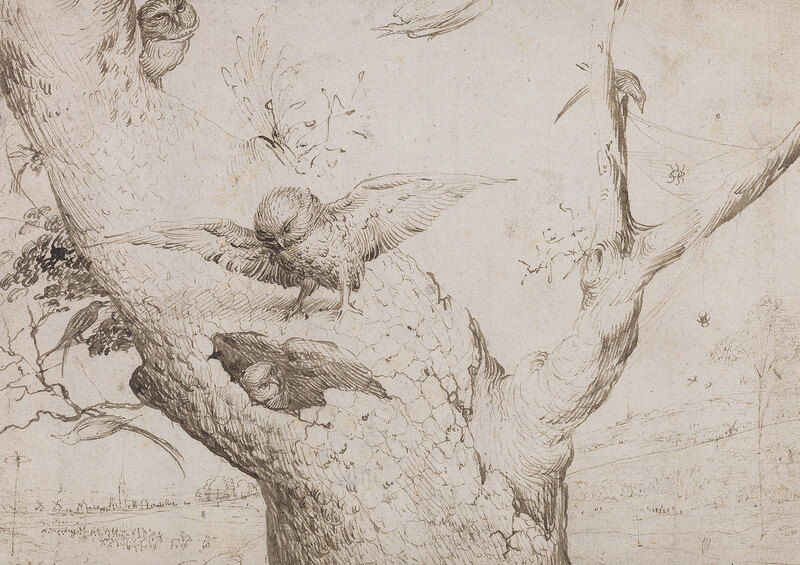 Taking centre stage at the exhibition is The Owl’s Nest, a remarkable piece by Jheronimus Bosch. The drawing owes its exceptional character to the quality of its execution and its rarity, for only very few works on paper of Bosch have survived. The motif of an owl in its natural environment also carries allegorical significance given the gallows visible in the distance. Indeed, the life of the owl is often regarded with suspicion, and owl-like behaviour is associated with a life of sin. Pieter Bruegel, considered alongside Bosch and Van Eyck as one of the greatest figures in Flemish painting, is also featured. Six of his drawings produced between 1552 and 1562 are exhibited. Among these, the public can discover three sketches for engravings representing allegories of virtues and impressive landscapes. In addition, the public is invited to admire a series of eight rare fifteenth-century pieces. Extremely delicately drawn, mostly by silverpoint, these include Portrait of a Young Woman by Petrus Christus, a follower of Van Eyck. Also on display are twelve round drawings of the months of the year conceived as a medieval calendar by Hans Bol, which the Museum Boijmans Van Beuningen purchased in 2005. Flemish Renaissance artist Hans Bol was particularly renowned for his fine drawings. As a landscapist, he was the main successor of Pieter Bruegel. Aside from masterly sheets by artists such as Aertgen van Leyden, Joos van Winghe, Adam van Noort, Hans Speckaert, Maarten de Vos and David Vinckboons, all seldom shown to the French public, the exhibition is also an opportunity to view immensely varied ensembles by Maarten van Heemskerck, Hendrick Goltzius (sixteen drawings), Jacques de Gheyn, Karel van Mander, Johannes Stradanus and Abraham Bloemaert. The 142 drawings shown cover a period ranging from the late Middle Ages to the Dawn of the Golden Age, from 1460 to 1620. The variety and quality of this exhibition enables the public to discover the different functions of drawing: from the search for a composition or a group of figures for a painting, the study of folds and drapery, portrait drawings, to designs for stained-glass windows or engravings, studies of nature or depictions of imaginary scenes or episodes from literature or the Bible. Techniques used are so diverse that the exhibition and its catalogue constitute a perfect overview of early drawing in the Low Countries. Yvonne Bleyerveld, Albert Elen, Judith Niessen et. al. The mysterious drawing that attracted a great deal of attention in 2012 during the exhibition ‘The Road to Van Eyck’ in Museum Boijmans Van Beuningen is now on show in Paris. A video has been made about the discovery of this rare drawing by Jan van Eyck or one of his followers.